Below are some of the case studies and examples featured in the Weeds and Climate Change Technical Guide. If you would like to read about other case studies, download the PDF technical guide. Buffel Grass (Cenchrus ciliaris) and climate change, an example of an invasive plant from the Rangelands NRM Cluster. 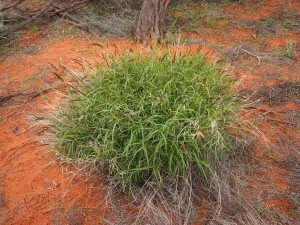 Buffel grass is one of the most widespread alien grasses in Australia (below) where it is both a desirable pasture species and an invasive weed driving altered fire regimes in nature conservation. Buffel grass disperses readily by wind often establishing initially along roadsides. It can disperse over long distances, mainly by humans. 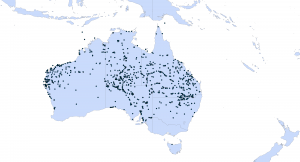 Distribution of buffel grass (Cenchrus ciliaris) (black dots) in Australia based on records from the Atlas of Living Australia (www.ala.org.au). NRM regions and a climatic suitability (Ecoclimatic Index, EI) projection for buffel grass in current climates using CLIMEX modelling. The higher the EI value, the more suitable is the climate for buffel grass. Values of EI = 0 (grey areas) indicates regions where populations are projected not to persist. 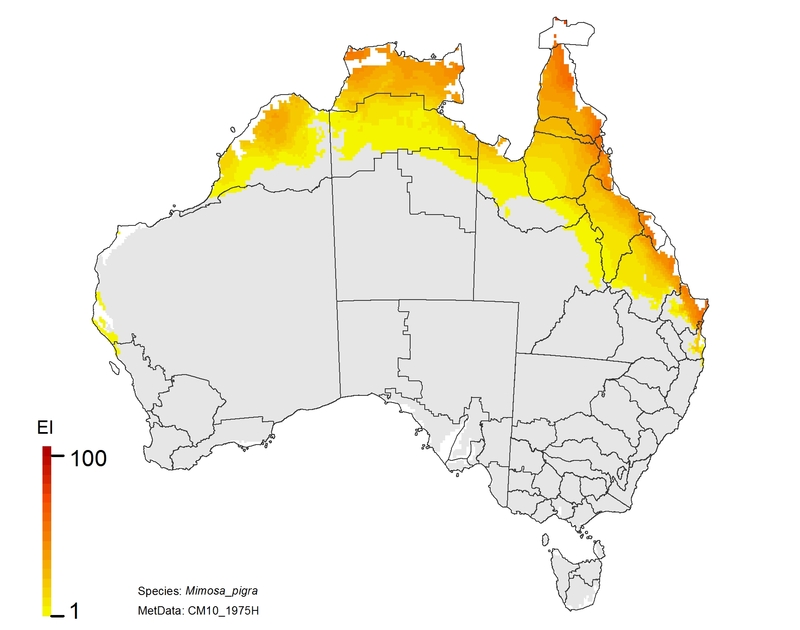 On the right, NRM regions and projected climatic suitability (EI) for buffel grass based on CSIRO Mk3 global climate model (GCM) projections for 2070, based on the A1B SRES emissions scenario. The regions of projected climatic suitability, as shown in the above maps indicate a southern range expansion for buffel grass is likely by 2070. This represents a particular threat to the high value nature conservation in areas such as the Great Western Woodlands, the Alinytjara Wilurara Natural Resources Management Region, and the Great Victoria Desert bioregion. Data is available for download in CSIRO’s Data Access Portal. The spectacular success of the small, shade-tolerant tree miconia (Miconia calvescens) in Tahiti is often attributed to the six cyclones that hit the Society Islands between December 1982 and April 1983. Researchers suggest that the cyclones explained the ‘demographic explosion of miconia’, and that ‘the speed of the invasion then became astonishing’. In Australia, Miconia calvescens is the target of a national eradication program and occurs primarily in north Queensland. 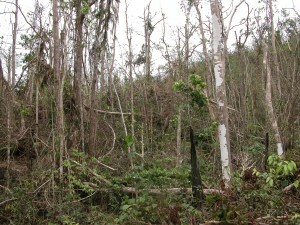 Both Cyclone Larry (2006) and Cyclone Yasi (2011) caused significant structural damage across the region in which miconia occurs. Growth rates of miconia more than doubled in the year following Cyclone Larry and the species recruited readily in cyclone damaged forest and showed low mortality even 5 years post-cyclone. The widespread and massive disturbance caused by cyclones provides ideal conditions for rapid recruitment and spread of invasive species. With an increasing intensity of tropical cyclones we should expect to see significant structural and compositional changes to tropical forests as a result of plant invasions such as miconia. Miconia calvescens seedling, included in the monitoring of growth and recruitment after cyclone Larry. There are many bioclimatic modelling platforms available for estimating the potential distribution of weeds. The results of these models are often used to plan and make resource allocation decisions on eradication, containment and control of weeds. In Australasia, these maps often feed into the Post-Border Weed Risk Management System, identifying areas at risk of invasion (Standards Australia 2006). Thus, they have an important role in strategic weed management. Given their importance, how do we tell if they are useful for our intended purpose of gauging the potential distribution of invasive weeds under climate change? Here is a brief guide to some of the issues to consider, without necessarily dealing with more fundamental methodological problems that may exist. See the references below for a discussion of more technical issues. Does the modelled suitable area cover all the known distribution points of the weed under historical climatic conditions? If not, can the presence of outliers be explained by microclimates? Does the potential distribution map make ecological and biological sense? A model of a tropical species that shows high suitability for both the north east of Australia and the Nullarbor, but not other desert regions, is likely to be a result of a modelling artefact. 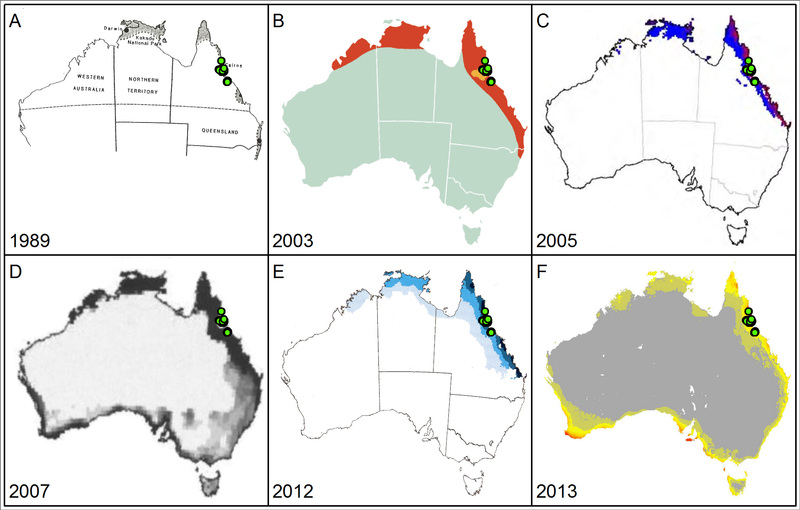 For Mediterranean climate species does the model show suitability for southern Australia, but not the Perth region despite the weeds’ presence there? Any model that is highly fragmented across inland Australia would have to be questioned, given our shallow environmental gradients. Does the modelling method have a history of being able to project reliably into novel climatic conditions? Is it clear whether or not the model projection involves extrapolation beyond the known environmental range of the species? Is there a detailed description of how the particular species potential distribution model was developed, including reference to species ecology, physiology and life history stages, and how issues of input data quality and model performance were handled? Modelling species niches accurately and reliably is a skilled operation, and doing so into novel environments doubly so. Highly automated modelling typically fails to detect even gross errors in input data and modelling variables, and makes projections that are sometimes highly erroneous, spanning multiple NRM regions (below). Are there taxonomic issues that may compromise the results? If any of these quality indicators are compromised for a model, you should treat the results with extra caution. Given the cost implications of incorrect risk assessments, it is often better to proceed with the caution you would apply if you had no knowledge, rather than rely on dubious information. For example, where there is doubt, you may wish to adopt an adaptive management approach to dealing with a potential invader, sharing surveillance information across NRM regions in the zone of modelling uncertainty. Modelling of the distribution for Chromolaena odorata (Siam weed) showing the very large potential variation between projections from different models. Some projections (a, b) simply show binary presence and absence, while multichromatic projections (c to f) have increasing colour intensity indicating increasing modeled suitability. 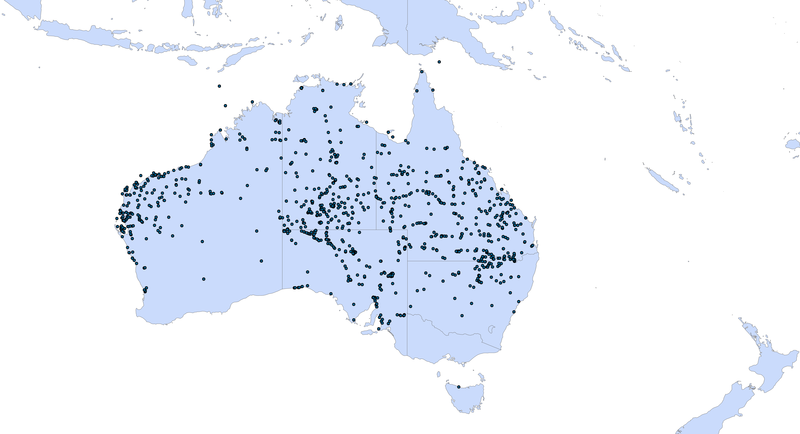 Green dots indicate currently known distribution records in Australia as recorded in Atlas of Living Australia in June 2014. Chosen projections were sourced from publically available online sources and were selected to highlight geographic variation in modelled suitability. We are aware of other model projections that exist in the public domain that differ again to these presented here. Projections arranged in chronological order were generated by models using a precipitation threshold (a), an unknown method (b), CLIMEX (c, e), the genetic algorithm for rule-set production (GARP; d), and MaxEnt (f). Projections also likely differ in their input data and methodology decisions. 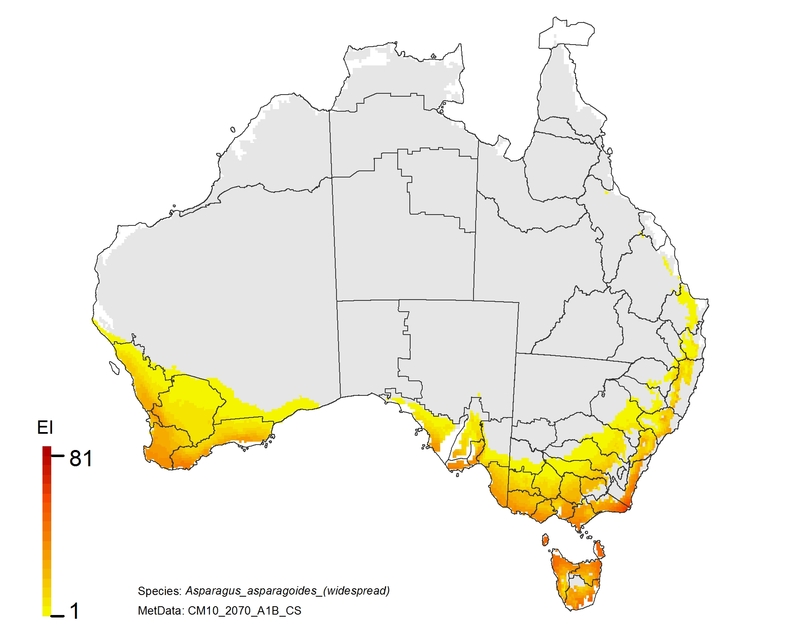 Sources: a – McFadyen (1989); b – CRC for Australian Weed Management (2003); c – Kriticos et al. 2005; d – Raimundo et al. (2007); e – Day and McFadyen (2012) f – Duursma et al. (2013) and Weed Futures (www.weedfutures.net). NRM regions and a climatic suitability (Ecoclimatic Index, EI) projection for bridal creeper in current climates using CLIMEX modelling. The higher the EI value, the more suitable is the climate for weed survival. Values of EI = 0 (grey areas) indicates regions where populations are projected not to persist. 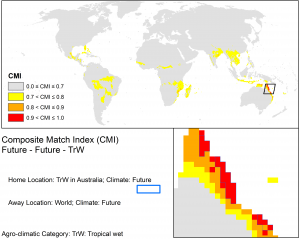 NRM regions and projected climatic suitability (EI) for bridal creeper based on CSIRO Mk3 global climate model (GCM) projections for 2070, based on the A1B SRES emissions scenario. 1. There is an increased risk in Tasmania which supports the strategy of maintaining Tasmania free of this weed. 2. Inland in NSW and Queensland is currently free of the weed and is likely to remain so with climate change. Kriticos, D.J., Crossman, N.D., Ota, N. and Scott, J.K. (2010) Climate change and invasive plants in South Australia. Report for the South Australian Department of Water, Land and Biodiversity Conservation. CSIRO Climate Adaptation Flagship, Canberra, Australia 92 pp. Scott, J.K. and Batchelor, K.L. (2006) Climate-based prediction of potential distributions of introduced Asparagus species in Australia. Plant Protection Quarterly 21, 91-98. NRM regions and a climatic suitability (Ecoclimatic Index, EI) projection for mimosa in current climates using CLIMEX modelling. The higher the EI value, the more suitable is the climate for weed survival. Values of EI = 0 (grey areas) indicates regions where populations are projected not to persist. 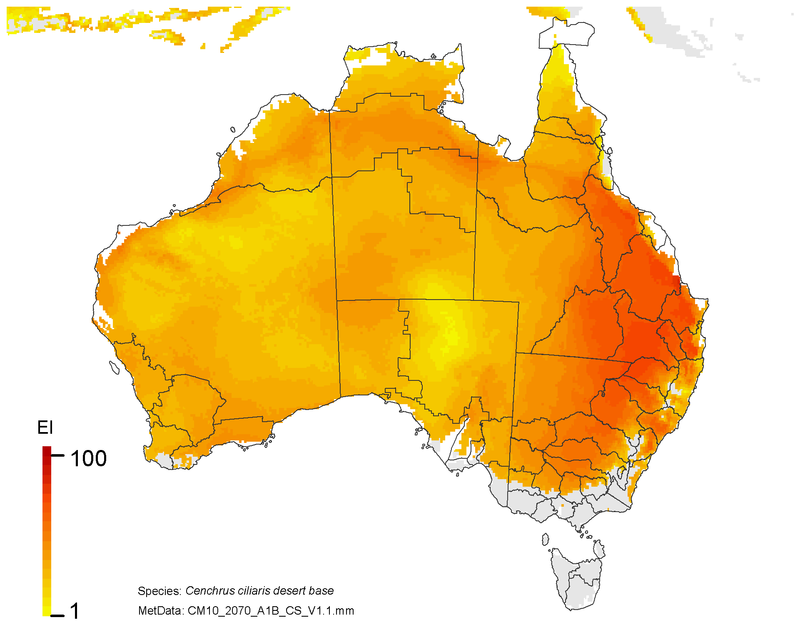 NRM regions and projected climatic suitability (EI) for mimosa based on CSIRO Mk3 global climate model (GCM) projections for 2070, based on the A1B SRES emissions scenario. 1. 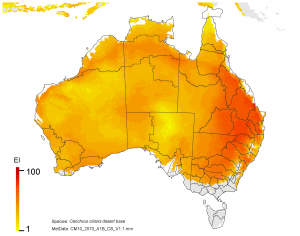 The Kimberley region shows a declining risk. This would make it more feasible to eradicate any populations that appear. 2. Limit the spread of Mimosa southward through Queensland. This is a no regrets climate adaptation policy. 3. There is potential for the plant to spread into NSW, so it should be treated as a quarantine issue for this state. Walden, D., van Dam, R., Finlayson, M., Storrs, M., Lowry, J. and Kriticos, D. (2004) A risk assessment of the tropical wetland weed Mimosa pigra in northern Australia. Australian Department of the Environment and Heritage, Darwin, Australia, 66 pp. 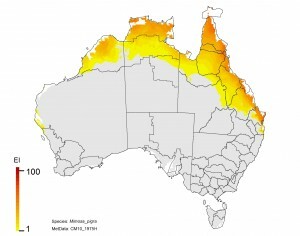 Northern Australia is predisposed to a unique set of biosecurity risks due to its close proximity to New Guinea and the Indonesian archipelago (areas with similar climates now and into the future), in combination with the annual northwest monsoon (figure below). Greater intensity tropical cyclones and projected increases in wind speeds over northern Australia may increase the likelihood of wind-borne incursions by weeds, pests and pathogens that occur in countries to the north. 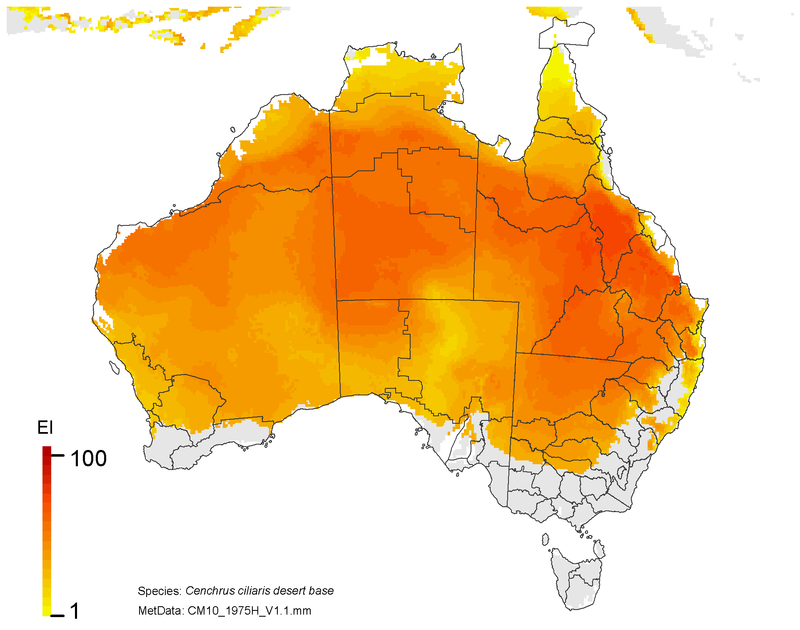 The Northern Australian Quarantine Strategy (NAQS) maintains a list of high-risk alien insect pests, plant diseases, weeds and animal diseases (www.daff.gov.au/biosecurity/quarantine/naqs). Targeted organisms are considered serious threats to Australia’s agricultural productivity, export markets or the environment. 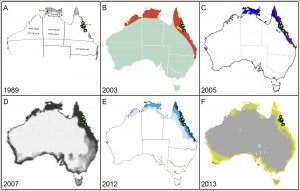 A number of species on the NAQS list are wind-dispersed and occur in countries in close proximity to Australia, and therefore are potentially at higher risk of introduction and subsequent invasion. This level of risk remains similar under current and future climates, as you can see in the figures below. For example, the densely tussocked, perennial grass Digitaria insularis (Poaceae) produces large volumes of wind-dispersed seed. It is an alien invader throughout the Pacific as well as in Papua New Guinea (photos, below). It is a serious problem because it competes strongly with crops and has developed herbicide resistance. Several species of wind-dispersed Asteraceae are also included on the NAQS list, including Chromolaena odorata (siam weed) (photos, below). 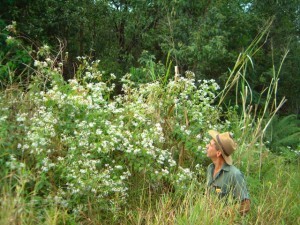 Siam weed is currently limited to the Wet Tropics region south of Cairns. However, it is a widespread alien in Papua New Guinea and is moving closer to the Torres Strait. In the future it poses a very significant risk of introduction to Australia via wind to the islands of the Torres Strait, Cape York Peninsula and the Northern Territory. CLIMEX match climates for the Wet Tropics using CSIRO Mk3 projections to 2070 based on the A1B SRES scenario. Kriticos, D.J. (2012) Regional climate-matching to estimate current and future sources of biosecurity threats. Biological Invasions 14, 1533-1544. Murphy, H.T., Metcalfe, D.J., Kriticos, D. and Lawson, T. 2009. Pro-active management of weeds based on their potential distributions under changing climatic conditions. In Proceedings of the 10th Queensland Weeds Symposium. Waterhouse, B. M. and Mitchell, A.A. 2012. Weeds of tropical Australia: how do they get here? Pages 9-12. The Weed Science Society of Victoria Inc., Frankston. Australia’s most detailed repository of information on weeds is held in the documents found on the www.weeds.org.au website. Each Weed of National Significance has a guide to its control. The National Weeds of Significance coordinators led the development of these plans and have developed the following set of climate change actions to complement the plan for each weed (www.weeds.org.au/climatechange.htm). Identify priority areas for research and monitoring of the response of weeds to climate change. Periodically monitor, record and analyse changes in distribution, abundance and impact of weeds to ensure management practices are adapted to minimize future impacts on biodiversity and primary production. Develop adaptation methodology and initiatives that reduce the impacts of weeds on biodiversity in future climates and incorporate these into management actions in conjunction with NRM regional bodies and other stakeholders. Research and understand the interactions between climate change, weeds, biodiversity and primary production, including negative and positive impacts: Improve knowledge of those impacts to develop specific impact reduction actions. This includes planning for situations where weeds may provide ecosystem functions (e.g. connectivity, harbour) that may no longer be provided by native species under altered climates. Raise community awareness and share knowledge of the increased impacts of weeds on biodiversity and primary production under climate change. Provide opportunities for public participation in impact reduction actions. The role of carbon dioxide in insect behaviour may be particularly relevant to biological control in Australia, in relation to one of the best known examples of successful biological control worldwide: Cactoblastis cactorum moth and its control of opuntioid cacti (e.g. Prickly Pear) (see figure below). To detect oviposition sites on healthy leaf pads of Opuntia stricta, the female moth uses the CO2 gradient generated by the plant’s CAM photosynthesis mechanism (a type of photosynthesis typical of cacti, other types of photosynthesis are C3 and C4). The eggs hatch on the leaf pads and the larvae then consume the leaf pad from the inside, leading to death of the cactus and control of the invasion. 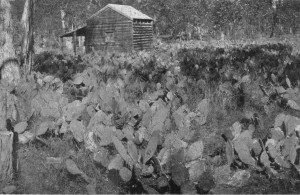 Invasion of Opuntia sp in Queensland after biological control (photo from Dodd 1940). While the moth’s sensors are adapted to pre-industrial levels of atmospheric CO2 concentration, a CO2 enrichment experiment showed that likely future CO2 levels are outside the range that tested moths could detect. The implication is that the moth may fail to recognise its host cactus under increased CO2 levels. 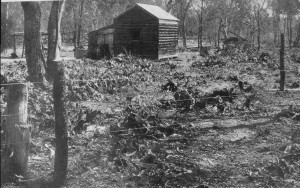 The invasion of Opuntia cacti in Queensland and New South Wales in the 1930s covered more than 25 million hectares and at its peak was expanding at about 50 ha per hour. Today, the cactus is still scattered at low levels across the old invasion area. Any widespread failure of the Cactoblastis biological control agent due to rising atmospheric CO2 concentrations could lead to a proliferation by opuntioid cacti that would be at the scale of a national disaster for Australia. The adaptation response of invasive plant managers is to monitor the levels of control of cactus by Cactoblastis over the invasive plant’s range. The monitoring would indicate if other existing biological control agents could become more effective or additional biological control agents could be sought. Additional control methods could be applied or investigated if it looks like the biological control is failing. There is also an urgent need for research to establish whether or not the moth could acclimate to the increased CO2 levels or if there is genetic variability and the potential for evolution to maintain the ability to detect the host cactus. Dodd, A. (1940) The biological campaign against prickly-pear. Government Printer, Brisbane. Mann, J. (1970) Cacti naturalised in Australia and their control. Department of Lands, Queensland. Osmond, B., Neales, T. and Stange, G. (2008) Curiosity and context revisited: Crassulacean acid metabolism in the Anthropocene. Journal of Experimental Botany 59, 1489-1502. Stange, G., Monro, J., Stowe, S. and Osmond, C.B. (1995) The CO2 sense of the moth Cactoblastis cactorum and its probable role in the biological control of the CAM plant Opuntia stricta. Oecologia 102, 341-352. Biofuels: new crops or invasive species? Climate change and concerns about the sustainability of traditional sources of energy (and links between these drivers) are leading to the formulation of ambitious targets for renewable energy. Biofuel crops, which may be either native or alien, offer potential benefits to a world adjusting to the challenges of climate change and declining fossil fuel stocks. However, the plant attributes that make plants ideal biofuels crops are frequently the same as those that make them invasive: fast growth, high yields, and tolerant of a wide range of environmental conditions (Barney and DiTomaso 2011, Ragu et al. 2006). In particular, tropical lignocellulosic crops (woody trees and grasses) and oil seed crops (e.g. Millettia pinnata, Pongamia, see figure below) have huge potential for use as feedstocks (Richardson 2013) and their feasibility for large-scale production of energy is currently being investigated in Australia. However, there is considerable uncertainty regarding the commercial viability of many potential biofuel species in Australia. For example, despite there currently being no established industry or demand for Pongamia oil in Australia, and significant uncertainty around many aspects of the production system (Murphy et al. 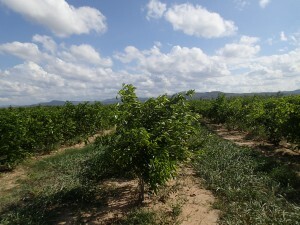 2012), an increasing number of growers are investing in large-scale plantations. It is inevitable that there will be some abandonment of plantations due to their being commercially unviable. Prudent risk management requires balancing the potential climate change mitigation benefits of biofuel crops with measures to reduce maladaptive impacts on biodiversity, other production systems and livelihoods, should these species become an invasion risk (Kriticos et al. 2013). Pongamia plantation in north Queensland (source: Helen Murphy, CSIRO). Barney, J.N. and DiTomaso, J.M. (2011) Global climate niche estimates for bioenergy crops and invasive species of agronomic origin: Potential problems and opportunities. PLoS ONE 6, e17222. Kriticos, D.J., Murphy, H.T., Jovanovic, T., Taylor, J., Herr, A., Raison, J. and O’Connell, D. (2013) Balancing bioenergy and biosecurity policies: estimating current and future climate suitability patterns for a bioenergy crop. GCB Bioenergy, doi: 10.1111/gcbb.12068. Murphy, H., O’Connell, D., Seaton, G., Raison, R., Rodriguez, L., Braid, A., Kriticos, D.J., Jovanovic ,T., Abadi, A., Betar, M., Brodie, H., Lamont, M., McKay, M., Muirhead, G., Plummer, J., Arpiwi, N., Ruddle, B., Saxena, S., Scott, P., Stucley, C., Thistlethwaite, B., Wheaton, B., Wylie, P. and Gresshoff, P. (2012) A common view of the opportunities, challenges, and research actions for Pongamia in Australia. BioEnergy Res 5, 778-800. Raghu, S., Anderson, R.C., Daehler, C.C., Davis, A.S., Wiedenmann, R.N., Simberloff, D. and Mack, R.N. (2006) Adding biofuels to the invasive species fire? Science 313, 1742-1742. Richardson, D.M. 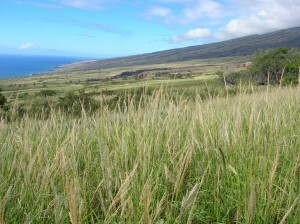 (2013) Lessons learned: how can we manage the invasion risk from biofuels? Biofuels 4, 455-7.